British movie Slumdog Millionaire enjoyed a stunning night at the British Academy Film Awards in London, winning seven prizes including best film. In a good night for UK talent, Kate Winslet won best actress for The Reader - effectively beating herself, as she was also up for Revolutionary Road. The late Heath Ledger was named best supporting actor for playing The Joker in Batman blockbuster The Dark Knight. 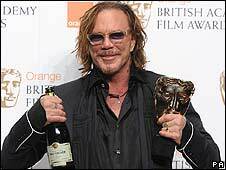 The Wrestler star Mickey Rourke took home the best actor trophy. As he collected his award, he made the audience laugh by swearing during his acceptance speech. He then dedicated his award to late actor Richard Harris, adding: "It's such a pleasure to be back here, out of the darkness." 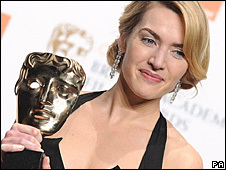 It is the second time Winslet has won a Bafta, having previously been named best supporting actress for Sense and Sensibility in 1995. Her latest victory comes hot on the heels of a double win at January's Golden Globes. As she collected her Bafta, Winslet paid tribute to the late producers Anthony Minghella and Sydney Pollack, who both worked on the film. "You are much missed today, and you will be much missed for many years to come, and this is for you. Thank you. Thank you," she said. She also thanked her friends and her parents, who were with her at the ceremony. However, the actress said she could not look at them for fear of bursting into tears. Penelope Cruz said she was "honoured and grateful" to be named best supporting actress for her role as Maria Elena in Vicky Cristina Barcelona. Danny Boyle, who directed Slumdog Millionaire, was named best director. On stage he told the audience he wanted to thank everyone who had helped put in an extension cable so his father could watch the show at home. As he thanked his family on stage, his son stood up and shouted from the audience: "I love you, dad." The rag-to-riches movie - largely set in the Indian city of Mumbai - is hotly tipped to win best picture at the Oscars. The film, starring former Skins actor Dev Patel, also won awards for its editing, cinematography, music and sound. Slumdog writer Simon Beaufoy was awarded the prize for best adapted screenplay, saying it was a "great privilege" to have won. "I have two pretend Baftas at home, so it's great to have a real one," he said. He revealed one Bafta was made of chocolate, while the other was a plastic replica he purchased online. He added that the whole cast were "genuinely thrilled" at how people have been reacting to the film. Asked whether he thought he was in line to win an Oscar, however, he said: "There's no sense of entitlement." He also revealed that at one point he thought the movie was going "straight to DVD". Heath Ledger had been favourite to take the best supporting actor award and duly did so for his performance in the latest instalment of the Batman series. The star, who was found dead in his Manhattan apartment in January last year, also won a posthumous Golden Globe last month. The Curious Case of Benjamin Button, starring Brad Pitt, had been nominated for 11 awards but walked away with just three. Pitt, who arrived at the ceremony with his partner Angelina Jolie, missed out on the best actor award. The movie, which tells the tale of a man who ages backwards, was recognised for its production design, its visual effects and its make-up and hair. Documentary Man on Wire scooped best British film, while dark comedy In Bruges won the original screenplay trophy. Elsewhere Wallace and Gromit creator Nick Park was on hand to pick up the short animation prize for their latest adventure, A Matter of Loaf and Death. Doctor Who star Noel Clarke was named the winner of the Orange Rising Star Award, which is voted for by the public. The star and director of urban drama Adulthood quoted President Barack Obama as he accepted his prize, telling his young fans: "Yes, we can." French movie I've Loved You So Long, starring Kristin Scott Thomas, beat Waltz With Bashir and Gomorrah to the best foreign language film award. The final prize of the night went to filmmaker Terry Gilliam, who received the prestigious Bafta Fellowship. Earlier the former Monty Python member had joked he would be "blubbering" as his name was called and that he would have to be carried on stage. Culture secretary Andy Burnham has praised the "talented individuals" who won this year, saying it had been "a brilliant night for the British film industry". "I hope that in a fortnight's time we will be celebrating fresh triumphs on the biggest international stage there is, at the Oscars." Kate Winslet win Best Actress for The Reader!